Thread: GCB market to take a breather this year? A freehold bungalow in Jervois Hill. One reason for the high value of transactions was the fact that that the top 10 deals in 2018 were between S$30 million and S$94 million each. THE Good Class Bungalow (GCB) market may take a breather in 2019 from the strong showing last year, according to some observers, who highlight among other things an exceptionally high base in 2018, with several big-ticket transactions. The total value of deals in GCB Areas climbed 16 per cent to S$1.03 billion in 2018 from S$888.6 million in 2017, based on an analysis of caveats data by List Sotheby's International Realty, Singapore (List SIR). The firm's chief operating officer, Leong Boon Hoe, said last year's tally is the first time the figure crossed the S$1 billion mark since 2011. Market watchers told BT that on top of the S$1 billion worth of transactions for which buyers lodged caveats last year, there may be around S$400 million in deals done last year that were not caveated -- a jump from around S$100 million for 2017. Typically, a buyer would lodge a caveat, which is a claim of interest in a property, after exercising the option to purchase. However, lodging of caveats is not compulsory. Looking purely at the caveated deals last year, Mr Leong said that one reason for the high value of transactions was the fact that the top 10 deals in 2018 were between S$30 million and S$94 million each, either due to big land sizes or because they were for newly-built bungalows. In contrast, the top 10 deals for 2017 were between S$26 million and S$46 million each. In all, the caveats were lodged for 42 deals last year, unchanged from the previous year. The first half of 2018 saw caveats lodged for 17 purchases in GCB Areas, followed by 25 in the second half. Realstar Premier founder William Wong said that sales volume for the second-half would have been higher, at about 32 deals, had the July property cooling measures not been rolled out. He estimates that on the whole, GCB prices rose by about 5 to 7 per cent last year - led by prime locations. "Although prices are now considered high, they may still increase a further 3 to 5 per cent this year - due to very strong demand for GCBs in prime locations, which are still very short in supply." In similar vein, KH Tan, managing director of Newsman Realty predicts that for this year, prices in ultra-posh locales like Nassim and Cluny near the Botanic Gardens should be stable and possibly increase by up to 5 per cent. "However, in the Holland belt, prices should remain the same or drop up to 2 per cent, while in the Bukit Timah belt, prices may soften by up to 5 per cent." From the high base in 2018, the volume and value of deals in GCB areas will most likely fall in 2019, Mr Tan predicts. "With uncertainty surrounding US-China trade tensions, local buyers may be more careful. However, new Singapore citizens who have been wanting to buy a GCB in a super-prime location may be willing to commit if they find the right property." JLL senior consultant Karamjit Singh too predicts that the volume and value of GCB deals may ease from last year with buyers turning cautious on the back of the cautious economic outlook and the dip in the wider residential market sentiments. "With sellers not ready to budge, the price gap will widen and volumes will come down temporarily." Mr Wong of Realstar, however, expects the number of bungalow deals in GCBAs to increase by about 20 per cent this year, citing pent-up demand from those who might have held back last year to gauge the effects of the July cooling measures. Bruce Lye, co-founder and managing partner of property agency SRI, said: "Based on the demand we are seeing and the number of buyers we have in hand, things are still looking rosy for the GCB market this year." Among his firm's potential GCB-buyer clients are new Singapore citizens, mostly from China. "They come from a good mix of industries. A few have cashed out their investments in tech companies. Some are members of families in the property development business that have established operations in Singapore." The hikes in additional buyer's stamp duty (ABSD) rates, which were part of the July cooling measures, are not going to affect these well-heeled new citizens as they are first-time buyers, he argued. Last year marked record prices being achieved in the GCB market in terms of both per square foot of land area and absolute prices. In June, seasoned bungalow investor George Lim sold a newly-built bungalow he developed in Jervois Hill, at a record S$2,729.52 psf. The S$41.2 million property was bought by the daughter of Alan Chong, the cash-flush founder of Wah Loon Engineering who earlier last year had sold most of his stake in the company to a subsidiary of Euronext Paris-listed infrastructure and construction giant Vinci SA. 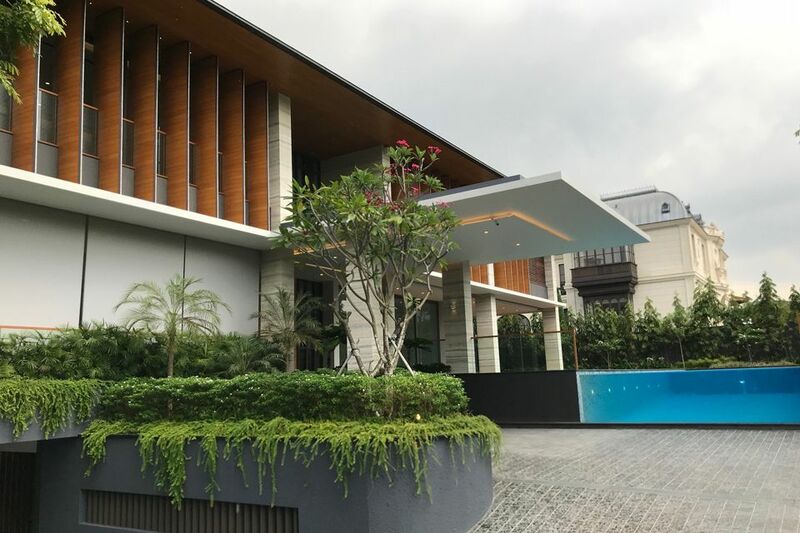 Meanwhile, Tony Tung, the Singaporean chairman of Hong Kong-based Winson Group, which is involved in oil trading, marine bunkering and oil storage and terminal facilities, picked up a bungalow on 42,515 sq ft of freehold land in Nassim Road near the Botanic Gardens for S$105.3 million. This is believed to be the biggest transaction in absolute price terms in a GCB Area. The property is expected to be redeveloped. Since the second half of 2012, the government has generally not granted approval to foreigners to buy a landed home in a GCB Area. Foreigners granted such approval must be Singapore permanent residents and have made exceptional economic contributions in Singapore. Meanwhile, in the waterfront residential enclave of Sentosa Cove - the only place in Singapore where a non-PR foreigner may buy a landed home, albeit still subject to government approval - 11 bungalows changed hands last year at a total value of S$180.2 million. This was lower than the 15 deals adding up to S$226.9 million in 2017, based on List SIR's caveats analysis. The 15 deals in 2017 were a marked improvement from the four transactions in each of the preceding three years. Steve Tay, senior associate vice-president at List SIR, said: "Sentosa Cove bungalow prices bottomed in 2017, resulting in a spike in sales volume. The momentum . . . continued in the first half of 2018 until the July measures. The mood in the second half was more muted but interest levels did return towards the end of the year, as evinced by the sale of a bungalow in Cove Drive in November at a price of S$23.99 million, hitting S$2,515 psf. On the whole, current bungalow prices in Sentosa Cove are still near the bottom and likely to remain at this level in 2019. "As such prices are still attractive and lean towards the favour of buyers," said Mr Tay. "There has already been a healthy number of viewings in January. We expect sales activity to remain stable and similar to 2018, with 10 to 12 bungalow sales in 2019. "We can expect more interest from well-heeled locals and newly-minted permanent residents who are buying their first residential property. They are the ones who are unaffected by the higher ABSD." Mr Lye of SRI too expects Sentosa Cove bungalow volumes this year to remain similar to last year. "Prices will edge up, but not rise rapidly this year. "We see bungalows being put up for sale by expats who are motivated to sell as they are relocating out of Singapore. "Singaporeans are showing keen interest albeit still bargain hunting. Having seen peak prices in Sentosa Cove in the past, they envisage the potential capital appreciation from current price levels. They also have the option to lease out any bungalow they buy on Sentosa Cove." Rents for bungalows in the waterfront housing precinct are holding up due to limited rental inventory, he added. A foreigner granted approval to purchase a landed home anywhere in Singapore can use the property for owner-occupation only.